Do you want to repair your computer like Advanced PC Technician? We have got the D7 Computer Repair Multi tool for you to troubleshoot your PC automatically with one click. 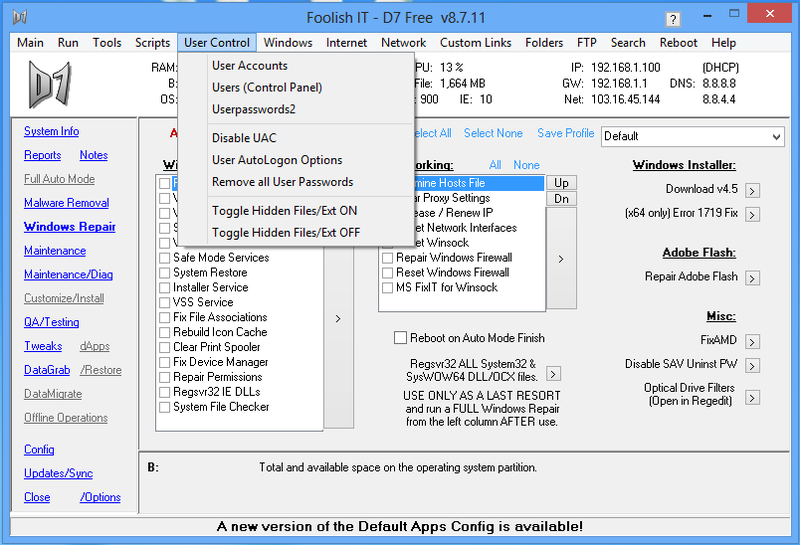 D7 is a portable application designed for Advanced troubleshooters to fix all the computer related problems with automation.D7 is a powerful suite of free system utilities from Foolish IT, developed only for pro PC technicians, Net Admins, and advanced users. D7 has all the tools to fix the computer problems, also has the option to add your own Troubleshooting utilities in the interface. It has includes the fixes for all the common Windows problems like repairing Internet Explorer, Repair Permissions, PIO/DMA mode fix, Repair Windows Update and more. It also contains a good collection of Windows tweaks. D7 interface provides the wide range menus to access various system areas. D7 is the much advanced system repair tool. You will get a warning EULA message when you have opened the D7 application like D7 can damage or kill your system. After you accept the EULA, one pop message will show like “OK, you’ve been warned!”. It shows that D7 is much more Advanced trouble shooters, so end users have to avoid this or should be extremely careful. D7 integrates lots of terrific portable freeware from Piriform, NirSoft, Sysinternals, Virus Total and others. D7 will do the tasks like scan, clean, repair, tweak, restore, customize, back up, update, maintain, and support single computers or networks. Automatically updates installed third-party Windows application using Ketarin, a free tool D7 uses to check for and install updates for all third-party apps. Automatically run 3rd party Windows tools like CCleaner, Defraggler to optimize Windows and clean your Temp Files, Empty Recycle Bin. Overall, D7 is the powerful application with a lot of tweaks and tools. If you are an expert troubleshooter, it is a much-needed multi purpose tool like Swiss Army Knife. The inexperience and ignorance will kill your system, so use it with extra cautious.